Get ahead of what you leave behind. Our approach was designed to uncover the unintended consequences commonly associated with a poorly planned estate. We work with your tax and legal advisors, and know the right questions to ask, leveraging more than 30 years of experience to proactively plan ahead. Because when it comes to the comfort of loved ones, or to the continued success of the business you helped build, nothing should be left to chance. Develop an assessment of your current situation and the future outcome of your current plan. 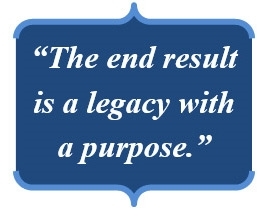 Leave a lasting impact on what you value the most in life with estate planning support services by Pinnacle Group. We take the time to understand your objectives, establish strategies that best support those intentions and then coordinate with tax, insurance, investment and legal professionals to help ensure all components are in place. The end result is a plan with purpose; a detailed plan that outlines distribution of assets, help minimize tax exposure and seizes on the philanthropic opportunities most important to you. Solutions that are uniquely yours. As partners in the development of your estate, we work closely with you to outline a plan that builds toward your distinct vision. It begins with a comprehensive discovery phase designed to capture a detailed picture of your finances. We identify goals, address barriers and help capitalize on potential opportunities. But most importantly, we have an honest conversation about what you value most. Only then can we deliver a plan that truly reflects your lasting legacy and provides peace of mind for the future.